There are about 1,497 students graduating yearly from a Nursing degree program in Iowa with 15 colleges and universities offering the major. College students are going to pay prices around $20,998 and $345,008 in Iowa to obtain their Nursing degree. Next you will find the top universities and colleges in Iowa for studying Nursing. Our ranking methodology includes only Iowa colleges and universities and evaluates them based on aspects like average salaries of graduates, accreditation, educational quality, and more. University of Iowa is a good option for students pursuing a Nursing degree. In addition to its bachelor's programs, University of Iowa offers graduate degrees in Nursing. The location in a big urban center is wonderful for young people seeking ample prospects for networking, experience, and discovery. Close to 87.0% of freshmen come back to this school for their second year. Iowa is committed to helping students to succeed, as confirmed by a 50.9% four-year graduate rate. A virtual tour is a good way to explore University of Iowa. Clarke University is one of the finest schools in the country for Nursing. At Clarke University, nursing learners enjoy the benefit of a very focused curriculum. Located in Dubuque, Iowa, this university is best suited for students who flourish in a city atmosphere. Each year, approximately 100.0% freshmen get scholarships, with the average award being $15,615. Considering that 7.0% of student loan borrowers are in default, Clarke's default rate of 4.8% is impressive. Get a better idea of what student life at Clarke is really like by seeing a few campus videos. It's hard to beat Luther College if you wish to study Nursing. Luther College nursing majors receive 7.4% more than the average nursing student. Students who enjoy a more slow-paced life will appreciate Luther College's location in the small town of Decorah, Iowa. About 90.0% of applicants send ACT scores, with the average score in the 26 range. If you're considering Luther, better hit the books. The typical SAT score of applicants is 1,063. For details, check out the college scorecard. Dordt College is a great option for students pursuing a Nursing degree. Students who have fun with a more slow-paced life will value the school's setting in the tiny town of Sioux Center, Iowa. First-year students are not required to live on-campus at Dordt College. If you are considering Dordt, hit the books. The average SAT score of applicants is 1,060. For more info, check out the college scorecard. Any student who is interested in Nursing has to take a look at Mount Mercy University. Mount Mercy University offers graduate degrees in nursing for those interested in an advanced degree. The location in a large urban center is tremendous for young people seeking out considerable options for social networking, excitement, and life. For students who want to keep going after earning a undergraduate degree, Mount Mercy University has graduate programs available. Not only is Mount Mercy University one of the best institutions in Iowa, 22.9% of its undergrads come from out-of-state. Get an idea of what being on campus at Mount Mercy College is like by viewing some campus videos. Any student who is interested in Nursing needs to take a look at Saint Ambrose University. The nursing degree program at St. Ambrose University is quite focused. The surrounding area of a large city is great for scholars trying to find adequate choices for social networking, excitement, and exploration. Score higher than 22 on the ACT? That is over the typical applicant score, so you have a good possibility of getting in. For students who wish to keep going following their undergraduate degree, Saint Ambrose University has grad programs available. View a few school videos for more information on what is happening on campus. Coe College is a wonderful choice for students pursuing a Nursing degree. Nursing majors from Coe College receive an earnings boost of around 0.4% over the typical income of nursing majors. Situated in Cedar Rapids, Iowa, this college is a good choice for learners who blossom in an urban atmosphere. Due to Coe's excellent student-to-faculty ratio of 11:1, there are many possibilities for students to work with their professors. Applicants should not let affordability concerns stop them from applying to this school since 97.0% of undergraduates receive financial aid. Want to know more about Coe College's campus? Go on a virtual tour. Any student who is interested in Nursing needs to look into Briar Cliff University. 24.3% of undergrads at Briar Cliff University are nursing majors. Positioned in Sioux City, Iowa, this college is a strong final choice for students who enjoy the exhilaration of a significant city. This school also has graduate degree programs for students who wish to carry on after earning a bachelor's degree. Students should not let concerns about affordability stop them from applying to this school since 96.0% of undergraduates receive school funding. Find each of the vital specifics on Briar Cliff by looking at their scorecard. Graceland University - Lamoni is a wonderful choice for students pursuing a Nursing degree. In addition to its bachelor's programs, Graceland University - Lamoni offers graduate degrees in Nursing. Students who appreciate the tranquility of life in the country may enjoy the rural area of Lamoni, Iowa. Freshmen are not required to live on-campus at Graceland University - Lamoni. Due to the diverse population at Graceland Lamoni, you will have plenty of chances to meet students from all walks of life. A virtual tour may be a great way to explore Graceland University - Lamoni. 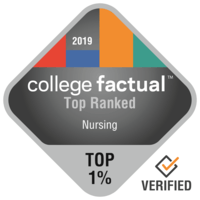 Morningside College is one of the best schools in the country for Nursing. 10.6% of undergrads at Morningside College are nursing majors. Sioux City, Iowa is the best area for young people who get pleasure from the active city life. Score more than 23 on the ACT? That's above the standard applicant score, so you should apply. The reasonable price of $20,781 for Morningside College is excellent for students who list cost as a major concern. Interested in learning more details on Morningside College's campus? Take a virtual tour.